This example shows how to robustly tune a controller for reducing vibrations in a flexible beam. This example is adapted from "Control System Design" by G. Goodwin, S. Graebe, and M. Salgado. Figure 1 depicts an active vibration control system for a flexible beam. The damping factors ζi are often poorly known and are assumed to range between 0.0002 and 0.02. Similarly, the natural frequencies are only approximately known and we assume 20% uncertainty on their location. 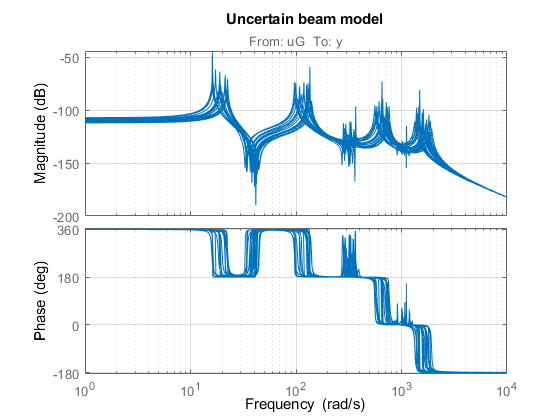 To construct an uncertain model of the flexible beam, use the ureal object to specify the uncertainty range for the damping and natural frequencies. To simplify, we assume that all modes have the same damping factor ζ. Next combine these uncertain coefficients into the expression for G(s). Visualize the impact of uncertainty on the transfer function from u to y. The bode function automatically shows the responses for 20 randomly selected values of the uncertain parameters. LQG control is a natural formulation for active vibration control. With systune, you are not limited to a full-order optimal LQG controller and can tune controllers of any order. Here for example, let's tune a 6th-order state-space controller (half the plant order). The LQG control setup is depicted in Figure 2. The signals d and n are the process and measurement noise, respectively. Build a closed-loop model of the block diagram in Figure 2. Note that CL0 depends on both the tunable controller C and the uncertain damping and natural frequencies. C: Parametric 1x1 state-space model, 6 states, 1 occurrences. Type "ss(CL0)" to see the current value, "get(CL0)" to see all properties, and "CL0.Blocks" to interact with the blocks. Use an LQG criterion as control objective. This tuning goal lets you specify the noise covariances and the weights on the performance variables. Now tune the controller C to minimize the LQG cost over the entire uncertainty range. Compare the open- and closed-loop Bode responses from d to y for 20 randomly chosen values of the uncertain parameters. Note how the controller clips the first three peaks in the Bode response. 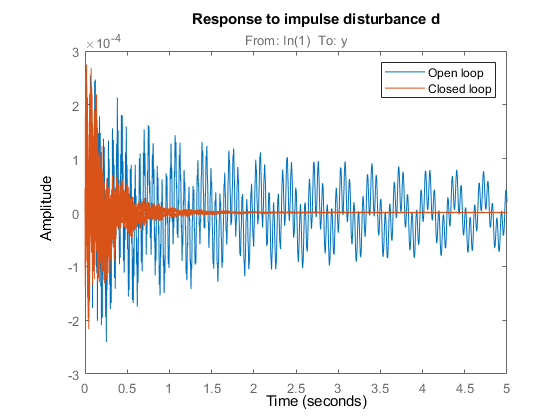 Next plot the open- and closed-loop responses to an impulse disturbance d. For readability, the open-loop response is plotted only for the nominal plant. 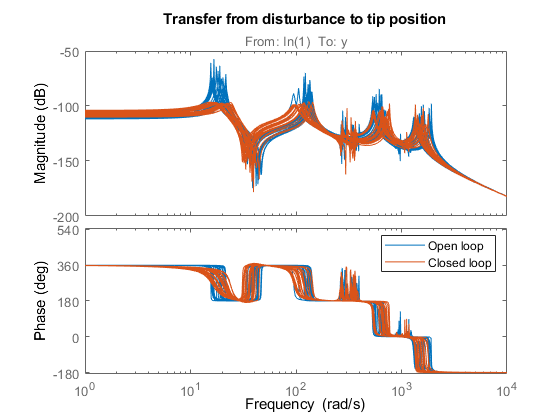 Finally, systune also provides insight into the worst-case combinations of damping and natural frequency values. This information is available in the output argument Info. 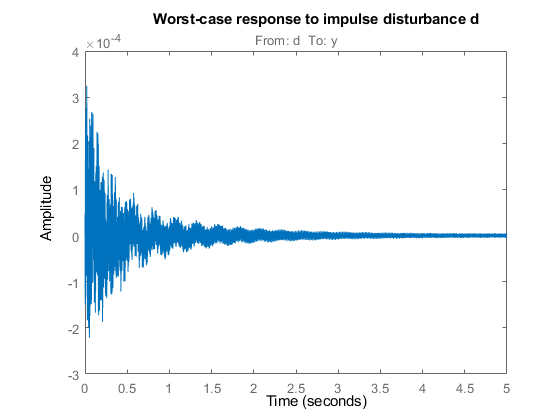 Use this data to plot the impulse response for the two worst-case scenarios.